Grown widely in North America, both across Canada and the United States. Maple is consistent in colour, light or pale blonde, a very appealing, warm looking wood. It has a varied grain, sometimes with Bird’s Eye figuring (a curly graining caused by an insect attacking the growing timber). The name Rock Maple (as in hard) is an indication that this timber used for robust flooring. In the UK it was widely used in commercial premises from the 1930s to 1950s. We often reclaim it from places such as school gyms, post offices and large warehouses. The wood-block can sometimes be found in 12″ lengths. This species is generally milled in quite a thick block as it was used for heavy wear. This species is quite a heavy timber, hard and resistant to shock, comparable to Beech in strength, however it is not suitable for external applications. Also used for furniture making, and veneers with the more figured timbers. 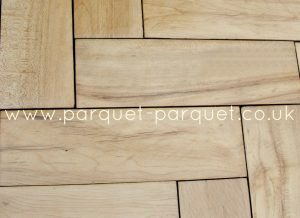 With its strength and resistance to wear is often used for attractive but heavy wearing parquet flooring. It glues and takes a polish very well, the finish has a lovely lustre. This species is an extremely popular choice amongst customers due to the light colour tones and is to be recommended. You can buy Maple here.